Where were the remains of the oldest-known dinosaur discovered? The fossil remains of Eoraptor (“dawn hunter”) were discovered in the Ischigualasto formation rock layer in Argentina, South America, which is the same area where the second oldest dinosaur, the Herrerasaurus, was found. In 1991, Ricardo Martinez made the first find of an Eoraptor; this was followed by the discovery of another skeleton in the 1990s by Fernando Novas and Paul Sereno. In 1993, the analysis of these remains led Sereno to name Eoraptor as the “first,” or most primitive known, form of dinosaur. The Eoraptor was smaller than Herrerasaurus, being about three feet (one meter) long. It had all the dinosaur characteristics found in Herrerasaurus, but its skull was a basic design. It also had a few specializations that would allow it to be placed in any of the major dinosaur groups. The primitive dinosaurs probably represented five percent of the total animal population in the beginning of the Late Triassic period. But they would soon spread throughout the world and dominate the land during the Jurassic and Cretaceous periods. 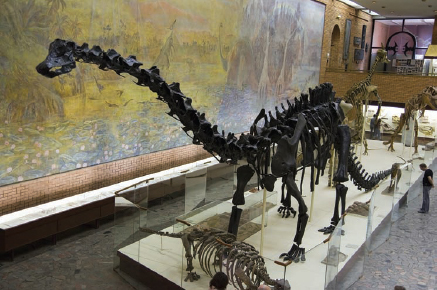 The main hall at the Paleontology Museum in Moscow boasts a full skeleton of a diplodocus. The Paleontological Institute of the Russian Academy of Science is the largest of its kind in the world (Big Stock Photo).